We all know that routine maintenance is part of owning a vehicle. Still, we seldom think much beyond changing our oil and keeping our tires rotated. Another very important part of routine maintenance for your vehicle is your spark plugs and ignition coils. While it may vary from model to model, usually around 70,000 miles is when it’s time to replace them. Be sure to check your vehicle’s manual or with a local automotive professional to determine exactly when your car needs the spark plugs and ignition coils replaced. What is an Ignition Coil and Spark Plug? 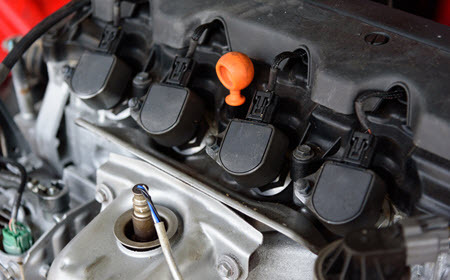 Knowing that the ignition coil and the spark plug need to be replaced is all fine and well, but what exactly are they and how do they function? The function of a spark plug is to ignite the air and fuel mixture inside your vehicle’s engine that has been compressed by the piston, creating combustion. There is one for every cylinder of your car and they should all be replaced at the same time. If they aren’t replaced at the same time, they will continue to fail and it will be an ongoing problem. An ignition coil is a device that powers your car’s spark plugs. In older vehicles, this was done via a distributor, but as technology has advanced distributors have, for the most part, become obsolete. The ignition coil or coil pack, as it is sometimes referred to, is essentially a tiny transformer that takes in 12 volts of electricity and steps it up to thousands of volts in order to supply the spark plug with the energy it needs to produce an efficient spark to keep your engine running at optimum levels. It is much more reliable than its predecessor, the distributor, and that is the main reason it is the most commonly used now. While the spark plug and ignition coil have no moving parts, they are still prone to failure. Some signs and symptoms of a failed or failing spark plug and or coil pack may be: decrease in mpg (miles per gallon), lack of engine power, rough idling, flashing check engine light, or a louder than usual engine noise. If you have or think you have, any of these symptoms there are a few things you need to know. If either the spark plug or ignition coil is failing, it could cause further damage to your engine that may go beyond a simple repair. If your check engine light begins to blink, it means that you do indeed have a misfire in your engine. The flashing check engine light then is telling you that one or more of the ignition components are malfunctioning. This could cause serious damage to other vehicle parts, such as your catalytic converters. Replacing your vehicle’s catalytic converters or other vital parts of the engine could end up being very expensive. A blinking check engine light needs immediate attention, and you should consult experts in your area as soon as possible. simple in some vehicle models, however, it can become a very difficult undertaking in most others. Many coil packs are made in one unit with wires coming off of them while others come packaged as individual units that sit directly on top of the spark plug itself. Unless you have previous mechanical experience, it may not be a great idea to tackle this one on your own. Due to the technicality and importance of the all parts involved. Remember to have a look at your vehicles owners manual to determine when you should begin to think about having this service done. If you live in or around Orange County area, such as Mission Viejo, Lake Forest, Costa Mesa, Irvine, Huntington Beach, Laguna Hills, or Laguna Nigel, CA, a quick and easy consultation with Mark Douglas Motorworks can help you see what your next step should be. The professionals at Mark Douglas Motorworks can make sure any issues that arise with your ignition coil or spark plugs is a quick and easy fix! When Should You Replace the EGR Valve in Your Audi?